He’s a “Hollywood Machine“. Orale. 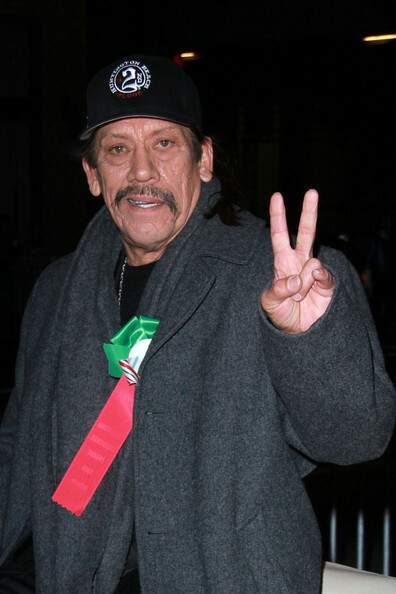 Danny Trejo at the Hollywood Christmas parade last month. A quarter of a century later, the actor has starred in seemingly every third Hollywood action movie, including “Heat,” “Con Air” and numerous Robert Rodriguez films (in which his character is almost always named for a weapon). Trejo averages – averages – between 10 and 13 movies per year, often showing up on set for a few days, plying his villainous trade and leaving. “Acting for me is like being a contractor or a plumber or a house painter. I don’t distinguish what house I’m gonna paint. Just ‘cuz I’m not getting as much money for this house, I still have to do a good job,” he said in slightly accented English, describing his attitude toward his earlier character parts. Trejo is already talking about “Machete 2“. But I’ll keep it real, this claymation commercial is better than the original movie. He can be hired to speak at your event.